Citronic CX23 Crossover is superb quality as you would expect from this brand. The CX23 is a 2-way stereo or 3-way mono active crossover designed to split frequencies so that low frequencies are delivered to the amp driving the sub cabinets and mid/top frequencies are delivered to the amp driving the mid/top frequency cabs. 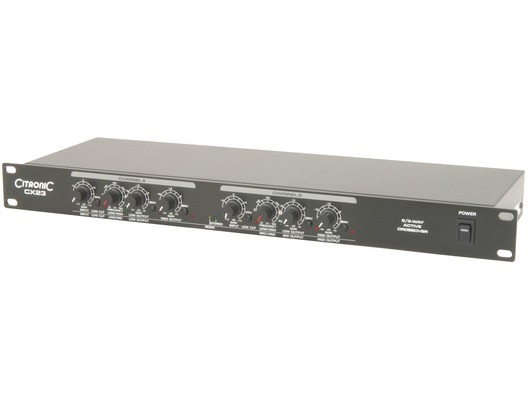 This type of system is more efficient and delivers more accurate sound quality, especially in larger PA systems. Here we have the Citronic CX23 2/3 Way Active Crossover in brand new condition and in B-Stock. The B-Stock versions would have been on display at a training evening or trade exhibition only and will come boxed 'as new' with all accessories and a 1-year warranty.